On November 29, 1926, 25-year-old stenographer Mary Moorehead died from a criminal abortion in the Chicago office of Dr. Lucy Hagenow. Hagenow was convicted of murder and sentenced to 14 years at Joliet Penitentiary, but was able to get her conviction overturned by the Illinois Supreme Court, which ordered a new trial in 1929. The judge, noting that there was no new evidence, dismissed the case, telling Hagenow, "You had better make your peace with God, Lucy Hagenow. I do not think your months on earth are many." Swimming champion Virginia Hopkins Watson was 32 years old and hoping tobecome as big a Hollywood star as her former teammate, Esther Williams, when she learned that she was pregnant in 1954. Deciding that a baby would hurt her career, Virginia arranged an abortion. Roger Fred Brenon, a lay abortionist, came to the Watson home on November 18. Brenon had met Virginia when she had been working as a swimming instructor at a club Brenon attended. After entering the living room with his large black bag, Brenon ordered Virginia's husband out of the room. A short time later Mr. Watson went into the kitchen and found Brenon boiling some sort of instruments on the stove. Brenon returned to the living room, where Virginia was waiting for him. About an hour and a half later, Brenon permitted Mr. Watson to return to the living room where Virginia was sitting on the sofa. She told her husband to write a check for "cash" for $150 and give it to "Dr. Rogers," as Brenon was calling himself that evening. A similar evening had been spent with Brenon at the Watson residence two years earlier. Virginia became progressively more ill, with nausea and vomiting, but she refused to seek medical care, saying that she was just sick with worry over her mother's serious illness. By November 26Virginia was having trouble breathing and was hospitalized. She developed peritonitis which led to pneumonia and infection around her heart. 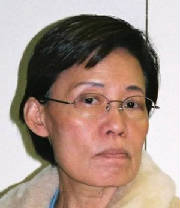 She died on November 29. And autopsy found that, evidently using the instruments he had been boiling in the kitchen, Brenon attempted an abortion, perforating Virginia's uterus in the process. Brenon confessed to police that he had put a tincture of green soap into Virginia's uterus, using a rubber catheter instead of his usual glass syringe. Virginia had most likely passed the fetus on the following day as her fatal illness set in. Brenon was convicted of murder in Virginia's death. 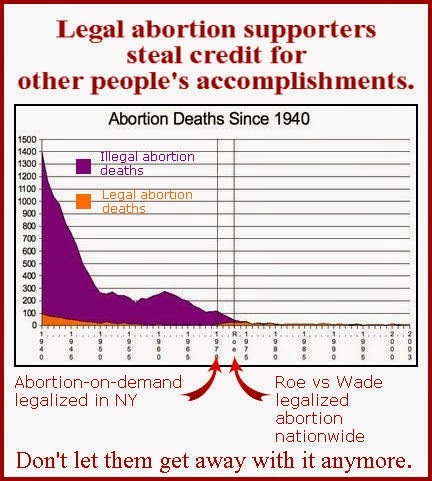 The criminal abortion deaths resulted in murder convictions for the identified perpetrators and an investigation to try to identify and prosecute a perpetrator for murder. The consequences for the safe, legal abortion death that took place on this date are dramatically different. In fact, for the abortionist, there was likely no unfavorable consequence whatsoever. 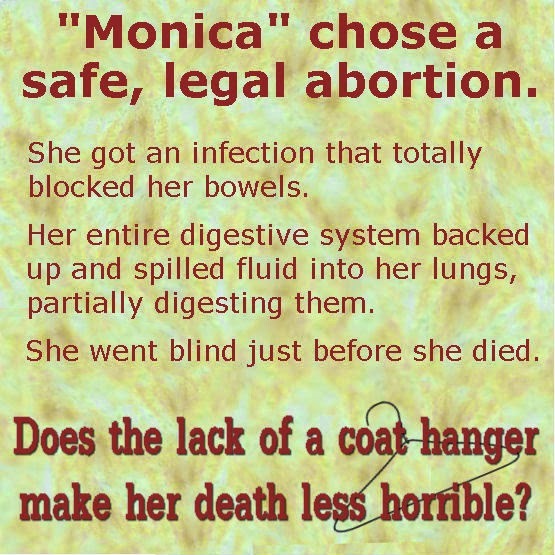 "Monica" is one of the women Life Dynamics identifies on their "Blackmun Wall" as having been killed by a safe and legal abortion. Her doctor decided that it was best to simply remove Monica's uterus with the fetus still in it. The hysterectomy was done under general anesthesia with no apparent complications. On the second day after surgery, Monica developed fever and nausea, and had no bowel sounds. The next day she felt unwell and had a distended abdomen. The next day, she felt better and resumed eating, but still had not had a bowel movement. Mrs. George Libby, age 18, died November 28, 1888, in Wahpeton in the Dakota territories. Before her death she admitted that she had bought abortifacient drugs from "a traveling doctor who made a specialty of selling such drugs." I have been unable to determine Mrs. Libby's given name. Are Today's Safe, Legal Deaths Better than the Illegal Death? I have very little information on today's illegal abortion anniversary. On November 26, 1923, 23-year-old Alice Johnson died at Chicago's West End Hospital from a criminal abortion performed there that day. 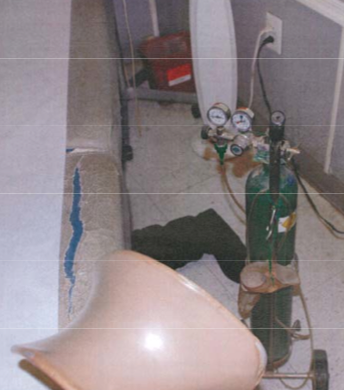 The coroner identified Dr. Lorenz Lapsky as being responsible for Alice's death. Lapsky was indicted by a grand jury for felony murder on December 15. The next death was a safe and legal death from New York in 1972. 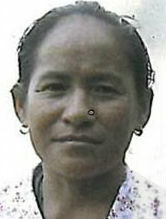 "Monica" was a 31-year-old mother of five. She requested an abortion when she was 8 weeks pregnant, but the abortion was delayed about a month in order to address "some health, personal and administrative problems." Her doctor decided that it was best to simply remove Monica's uterus with the fetus still in it. The hysterectomy was done under general anesthesia with no apparent complications. However, on the second day after surgery, Monica developed fever and nausea, and had no bowel sounds. The next day she felt unwell and had a distended abdomen. The next day, she felt better and resumed eating, but still had not had a bowel movement. 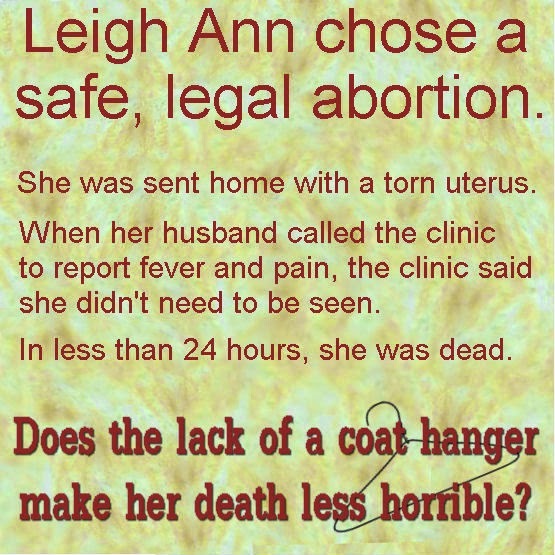 Our last death is Leigh Ann Alford, age 34, who underwent a safe and legal abortion at the hands of Dr. Malachy DeHenre at Summit Medical Center of Alabama, a National Abortion Federation member clinic, on November 25, 2003. Leigh Ann was discharged from the clinic 20 minutes after her abortion, according to a lawsuit filed by her husband. Within six hours, he said, he called the facility to report that Leigh Ann was suffering pain and fever, and was told that his wife did not need to be seen. He later found her lying unresponsive on the floor. She died about 18 hours after the clinic had sent her home. Death was attributed to hemorrhagic shock from an unrecognized uterine perforation. 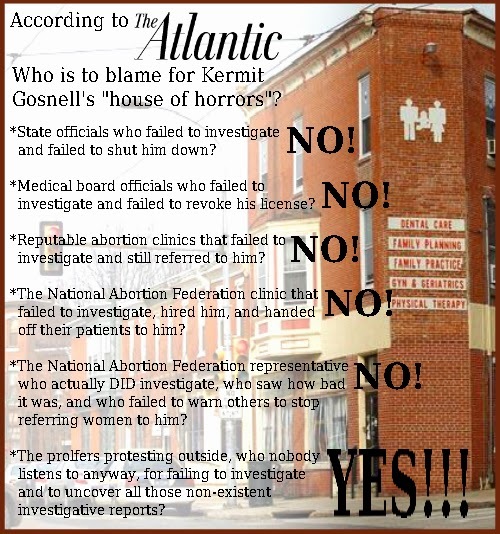 I recently addressed Garance Franke-Ruta's article in The Atlantic in which she takes abortion-rights blame-shifting to flabbergasting new levels by placing blame for Kermit Gosnell's "house of horrors" not on state authorities who had the means and authority to shut him down but chose not to, not on mainstream prochoice groups and people and facilities who referred women to him, or even on the highly-reputable National Abortion Federation clinic that had hired Gosnell and handed off their patients to him. Instead, Franke-Ruta places the blame squarely on the prolifers for failing to investigate Gosnell, failing to develop a rapport with the women going in and out, and insisting on trying to get states to inspect abortion facilities and shut down the ones that are seedy and unsafe. Notice who is not keeping a list of every abortion clinic in the country and doing a great deal of work investigating abortion-providing facilities and filing third-party complaints against them. It isn't prochoice organizations that investigate abortion facilities and file third-party complaints against seedy ones. It isn't abortion-rights groups that refer women to these facilities. It isn't mainstream abortion clinics that refer women to these facilities. It's those prolifers who are sniffing out and addressing seedy abortion mills. Franke-Ruta simply presumes that it's not the prochoice movement's job to investigate abortion facilities, try to get nasty ones smacked down by the state, and warn women away when the state fails to act. The prochoice movement bears exactly zero responsibility. It's the prolifers' responsibility. As if prolifers have any control over what goes on inside those facilities. As if prolifers have any control over prochoice groups and facilities that refer women for abortions. As if prolifers are the ones with all the power to dictate and address abortion practices. 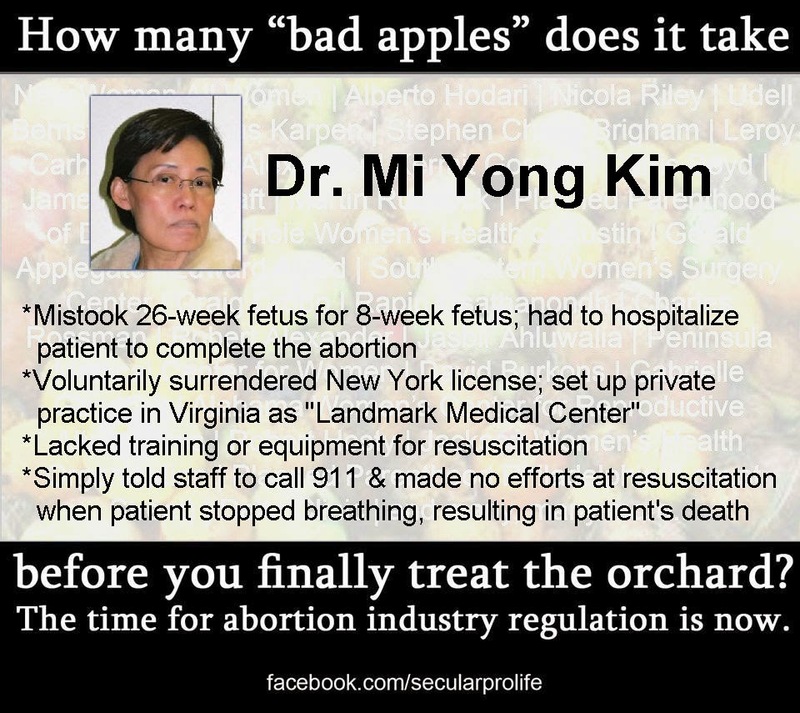 But on the flip side, she simultaneously blames prolifers for addressing seedy abortion mills, on the grounds that if you close down seedy abortion mills, there won't be as many abortion facilities and this will force women to go to the seedy abortion mills that the prolifers have been trying to shut down. Here's a novel idea, Ms. Franke-Ruta: Start holding prochoicers responsible for blocking efforts to address abortion quackery. Start holding prochoicers responsible for referring women to quacks. Start holding abortion practitioners responsible for what they're doing behind closed doors. And most of all, drop the schizophrenic attitude toward abortion quackery, that somehow prolifers can prevent it if only they'd learn to simultaneously find it and ignore it. Aren't Legal Deaths Equally Tragic? I have very little information on the three criminal abortion deaths that happened on this date. On November 24, 1907, homemaker Lizzie Paulson, age 38, died at County Hospital in Chicago from an abortion. John Nelson, whose profession I've been unable to determine, was sentenced to Joliet for his role in Lizzie's death. On November 15, 1912, 33-year-old homemaker Fannie Scheiner died at County Hospital in Chicago after an abortion perpetrated that day by midwife Annie Balnoka. Balnoka was arrested indicted by a Grand Jury but the case never went to trial. And two years later, on November 24, 1916, 24-year-old Mrs. M. Marazak died at Chicago's West Side Hospital from an abortion performed by an unknown perpetrator. I have much more information, however, on a safe and legal abortion death on this date in 1986. Eighteen year old Michelle Madden, a freshman at Mobile College, sought a safe and legal abortion from O.B. Evans at Family Planning Medical Center of Mobile, Alabama. It was performed on November 18, 1986. According to the friend who had accompanied Michelle to the abortion facility, a doctor had told her that her baby would have birth defects because of medication Michelle had been taking for epilepsy. ﻿That very day, Michelle's parents were preparing to go to Mississippi to spend Thanksgiving with Mrs. Madden's brother. They got a call from Michelle's roommate telling them that their daughter was sick. "We didn't think anything of it. We told her we were going to come the next day to pick her up," Michelle's mother told the Mobile Press Register. But before they could leave the house the next day, the house mother at the dorm called, asking if Michelle had gynecological problems. Again, the parents weren't particularly concerned. However, when they arrived at the dorm, they were told that Michelle was in the hospital. "We called the hospital and they said she was in surgery." When doctors operated on Michelle, doctors found a fetal leg bone, two pieces of fetal skull, and some placenta still in Michelle's uterus. The surgery to save her life was too late. Sepsis had already set in. Michelle's parents waited an hour at the hospital until the doctor finally came to them and told them that Michelle had undergone an abortion. Her parents hadn't even known that Michelle was pregnant. "From what he told me at that point [about Michelle's condition]," said Mrs. Madden, a nurse, "I knew that for her to live would be a miracle, on the order of the Lord raising Lazarus from the dead. She was in such bad shape I didn't see how she could make it." Michelle remained on life support until dying on November 24. Evans appealed on the grounds that this would "devastate him financially", because his malpractice insurance would only cover $1 million. During the appeal, the parties agreed to settle for $5 million, with the insurance company paying the entire amount. Evans then sued his insurance company for not having settled with the family for $1 million prior to the trial, thus subjecting him to "emotional distress, humiliation, damage to his reputation, and loss of business" -- such "emotional distress", he asserted, was "so severe that no reasonable person could be expected to endure it." Interesting, that the lawsuit, and not the needless death of an 18-year-old girl who had trusted him, is what caused Evans such emotional distress. And his emotional distress, I guess, was somehow more severe than the distress he caused to Michelle Madden's family. Garance Franke-Ruta, writing in The Atlantic, addresses "Kermit Gosnell and the Anti-Abortion Movement's Intelligence Failure." Yes, you read that right. 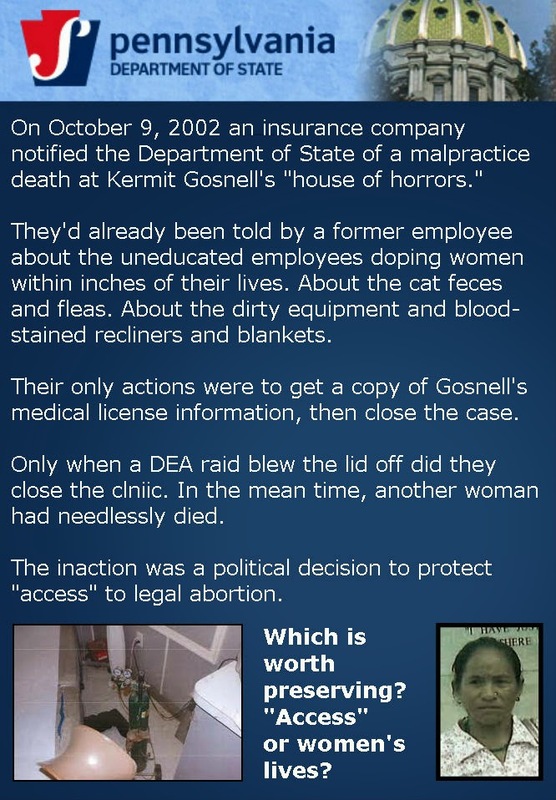 Franke-Ruta does not place blame on state bureaucrats who failed to investigate Gosnell's "house of horrors" and failed to shut it down. Franke-Ruta does not place blame on the medical board, which failed to investigate Gosnell and failed to yank his medical license. Franke-Ruta does not place blame on the reputable abortion clinics that failed to investigate Gosnell's clinic before referring women there. Franke-Ruta does not place blame on the National Abortion Federation Clinic that failed to investigate Gosnell, hired him, and handed off their patients to him. Franke-Ruta does not place blame on the National Abortion Federation representative who actually did investigate -- actually setting foot in the Women's Medical Society and seeing the appalling conditions for herself -- and failed to warn others to stop referring women to him. I reached out to Edel Finnegan, director of the Pro-Life Union of Greater Philadelphia, which runs the anti-abortion protests in the city, according to other groups involved in the abortion fight in the state. Finnegan ... confirmed that Gosnell's Women's Medical Society was in fact on the Pro-Life Union's radar for decades, and was not exempted from its picketing or prayer. 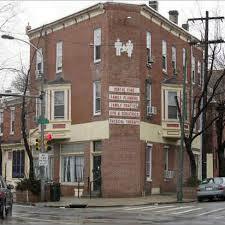 "We were involved with praying outside of the Gosnell facility. For about 20 years, there was a group of people going out on the second Saturday of the month" to area abortion facilities, she told me. Nor did the group pull public (such as court) records of complaints against Gosnell, which might have allowed anti-abortion advocates to see the pattern state regulatory authorities were ignoring, despite repeated complaints from doctors and Gosnell's victims. And what did Franke-Ruta think the prolifers were going to be able to do with whatever sketchy information they might have been able to glean about Gosnell? The Medical Board and the Health Department had declared that there was nothing amiss there. Were these entities any more likely to listen to a bunch of prolifers waving documents in their faces than they were to listen to Marcella Choung, who had actually worked in the clinic and had gone to them? Could the prolifers have maybe gone public with this information, or told prochoice groups about it, or handed it out to the women walking in? And exactly what does it ever accomplish when we do that? Anything we say, no matter how solid our evidence is to back it up, is blown off by abortion-rights activists and their friends in the mainstream press. What were the prolifers supposed to do? 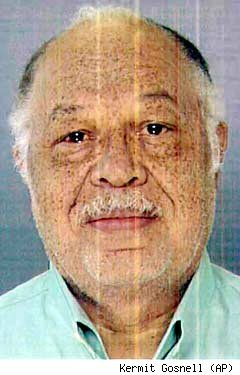 Amid the extraordinary cavalcade of system failures that allowed Gosnell to operate as he did, it's an open question whether the anti-abortion movement could have done more to call attention to his abuses if it had been able to forge any kinds of bonds of trust with the abortion-seeking women who were injured by him. It's because the prolifers didn't give the women walking in a sense of trustworthiness! Never mind the abortion-rights movement's demonization of prolifers. 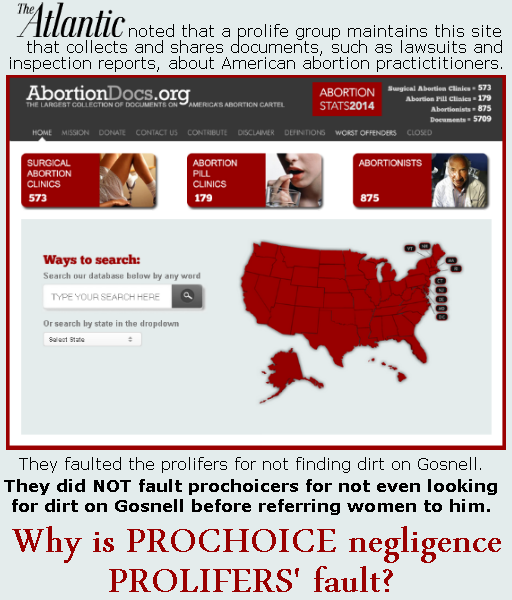 It's the prolifers' fault the women didn't go to them in droves, reporting the deplorable conditions inside Gosnell's facility. And again, Franke-Ruta somehow assumes that an abortion-rights movement and a left-leaning media monolith is going to listen to the prolifers when the state is insisting that all is well. Again, no matter how credible our information or how well documented, nobody takes it seriously except other prolifers. Franke-Ruta begins to ramble on about politics and how the mean old anti-abortion people actually insist on requiring abortion clinics to clean up their acts or close their doors. That makes it the prolifers' fault that the clinics are nasty. It's never the responsibility of the abortion clinics to actually run clean facilities that practice abortion in accordance with current Planned Parenthood or National Abortion Federation guidelines. It's never the responsibility of prochoice bureaucrats to smack down abortion facilities and practitioners who commit quackery. It's never the responsibility of prochoice groups to vet facilities and practitioners before referring women there. It's not even the responsibility of prochoice groups to at least look into things when the prolifers are waving documents around. It's all the prolifers' fault. Because otherwise the abortion-rights groups and individuals have to start holding each other -- and themselves -- accountable. And that's something that they're mysteriously either unwilling or unable to do. I have very scant information for two of the abortion deaths that took place on this date. On November 22, 1913, 33-year-old Hulda Tubbin died in Chicago, at the scene of an abortion perpetrated that day by Dr. Olaf Olson. Though Olson was indicted for felony murder, the case never went to trial. Four years after Hulda's death, 20-year-old Helen Devora died at Chicago's West End Hospital from an abortion performed by an unknown perpetrator. The third death had taken place much earlier, and half a continent away. On November 23, 1897, a funeral procession in Irvington, California, was stopped just as about the body was being loaded onto a ferry. The deceased was 24-year-old Ida Coakley, a homemaker who had only been married to John Coakley, a farmer, for two months. John reported at the time that he'd taken her to the office of Dr. Samuel Hall the previous day to be treated for a heart problem. He had left the doctor's office and returned that evening only to find his wife dead. Her body was promptly taken to a funeral establishment. A night watchman at a nearby bank had found the timing of the departure from the funeral establishment fishy and had contacted the police, hence the interruption of the funeral. Ida's body was taken for an autopsy, and a coroner's jury convened. They concluded "That Mrs. Ida Coakley, aged 24 years, nativity California, occupation housewife, residence Irvington, Alameda county, came to her death November 22, 1897, at 14 McAllister street, from septicaemia, following an attempt at abortion; and we further find that deceased came to her death from the effects of a criminal operation performed by Dr. Samuel H. Hall, and we further find that John Coakley was an accessory to the same crime." The verdict was signed by the majority, though a minority asserted that they did not believe sufficient evidence had been presented to indicate that Hall was the guilty party. The coroner's testimony had left no doubt that Ida's death had been from an abortion. The charges against John Coakley were dropped during the first trial in order to loosen his tongue against Hall. John Coakley proved useless during the trial, however. He broke down on the stand but the prosecution was unable to get him to say anything significant. The trial resulted in a hung jury, voting seven to five for acquittal. A second trial against Hall ended in acquittal after Coakley fled the state, leaving the prosecution minus the prime witness. On November 21, 1924, 24-year-old homemaker Mildred Bleschke died at Chicago's Grant Hospital from complications of an abortion performed earlier that day. The perpetrator was never identified.I've been unable to learn anything else about Mildred's death. That same day, 23-year-old Helen Bain, a homemaker, also died in Chicago from complications of a criminal abortion performed that day. Dr. George Slater was arrested on November 21 for Helen's death. Slater was indicted by a grand jury for homicide on May 1, 1926. In October of 1984, 14-year-old Sandra Kaiser went to a Planned Parenthood with her 21-year-old half-sister, Karen Flynn. The test was positive, and Sandra told Karen she wanted an abortion. Karen made an appointment and took Sandra to Reproductive Health Services (RHS) for a safe and legal abortion. Sandra was then shown a film called First Trimester Informed Consent. The film said, "A few women have negative emotional feelings after an abortion. You may feel slightly depressed, but those feelings are normal. .. [S]evere depression is not to be expected. If you are severely depressed after this abortion, it may be that your feelings about ending a pregnancy have not yet been completely resolved." Sandra died later of multiple internal injuries. Sandra's mother sued RHS for her daughter's death, charging that they had failed to contact the her mother in compliance with the law. An expert noted that at the time of Sandra's death, she had been depressed for several weeks, that the suicide was a direct consequence of this depression, and that the abortion was the "straw that broke the camel's back." The judge ruled that Sandra's mother and her witnesses failed to prove that the clinic had been negligent in exploring Sandra's history, and that Sandra had not been proved to have killed herself due to an uncontrollable impulse. To add insult to injury, the suicide had occurred during the time that the Missouri law governing consent of minors to abortion was enjoined by the Federal courts, so the law to protect Sandra and girls like her did not apply. On November 19, 1935, 24-year-old Mrs. Edith Eschrich died in New York from a criminal abortion. Though they were arrested, criminal abortion charges were eventually dropped against Dr. Tobias Ginsberg and his nurse because of insufficient evidence. On November 19, 1924, 38-year-old homemaker Elizabeth Strazdas died at Chicago's Mother Cabrini Hospital from complications of a criminal abortion performed that day. The person responsible for Elizabeth's death was never identified. I have significantly more information, however, on the November 19, 1862 abortion death of Clementina Anderson. She had left the house on Saturday, October 25, ostensibly to visit relatives in Newburgh. But word came on Wednesday, October 29, that the expected visitor had never arrived. What had become of Clementina? James Anderson and his brother asked the young woman's suitor, 26-year-old Augustus L. "A.L." Simms, if he knew anything of Clemetina's whereabouts. All Simms would say was that perhaps she had gone to the country to visit friends. This didn't set the frantic father's mind at ease. For three weeks, he unflaggingly searched for his missing daughter, asking Simms again and again for any clue as to where she might have gone. Simms insisted that he had no idea where Clementina was. The evening of November 19, the doorbell rang at James Anderson's home. He answered to find a hackman on the doorstep, accompanied by an unfamiliar woman. The hackman held what at first appeared to be a bundle of quilts in his arms. The strange visitors came into the house. But when the hackman lay the bundle down on the sofa, Anderson saw that it was actually Clementina. Taken completely by surprise at the sight of his long-missing daughter, he cried out joyfully that Clementina had come home. Mr. Anderson left the room briefly, overcome with emotion. In the moment her father was gone to compose himself, she breathed her last. A. L. Simms had begun courting Clementina about two years earlier, but after about six months Clementina's parents had hard words with the young man. Anderson suspected that Simms was still visiting his daughter behind his back. And as the summer of 1862 turned to fall, Mr. Anderson began to have darker suspicions about the young man's intentions. And he had voiced suspicions to Clementina that she might be pregnant. The official investigation into how Clementina had died would vindicate her father's suspicions in spades. Simms made a confession, painting himself as meekly going along with Clementina's every request, but as stalwart defender of his beloved, standing firm in all of his dealings with the abortionist. Around the 6th or 7th of July, Simms claimed, Clementina had told he that she was pregnant and asked him to buy Hooper's abortion pills on the advice of a married woman. 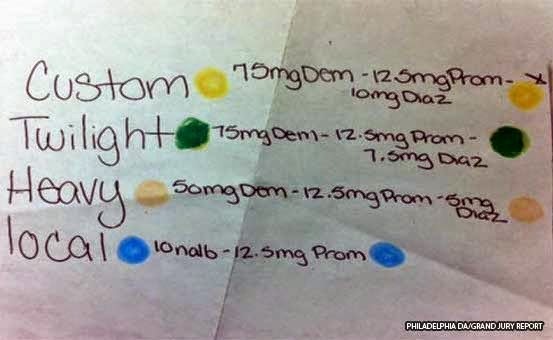 Simms said he got the pills, but they had no effect. Clementina, Simms told investigators, had pressured him to find another way of heading off the impending baby lest her parents learn of the pregnancy, but statements by others who knew Clementina indicate that she wanted to run away with Simms and get married. Meanwhile, Simms went to Dr. Browne and priced an abortion. Browne said that he'd "have her all right in two weeks at the furthest, or perhaps sooner, for the sum of $50". The deaths of Clementina's brother and mother put the abortion arrangements on a back burner for a few weeks. On October 25, Simms met with Browne again, who tried to raise the price, saying that his most recent patient had paid him $100, so he'd not do the abortion for less than $75. The two men haggled and finally Browne agreed to the originally quoted price of $50. Simms brought Clementina there the following evening. By this time, she would have been at least five or six months pregnant. Simms said he then went upstairs and helped Clementina to bed. She asked him to tell Browne not to come up that night, delaying the abortion another day. Simms returned the next evening around 7 p.m. Brown said he'd performed two operations, one in the morning and one in the afternoon, and "they were very successful, and that she would be over her trouble the next day". Simms went upstairs and found Clementina crying and in a lot of pain. He helped her to undress and go to bed. She'd described the two operations, reporting that they'd been very painful. When Simms went back downstairs, he said Browne told him to make arrangements to take Clementina away on Friday or Saturday. When Simms came to take Clementina home, Browne said that she was a bit unwell, but that this was normal and no cause for concern. Over successive days Simms returned for updates as Clementina's condition fluctuated, but he was not permitted to see her. Finally, on the 19th of November, Browne told Simms he could have Clementina taken away, but not to bring a carriage to the house. Simms found a hackman and with help from a woman at Browne's house loaded Clementina into the hack, instructing the driver to lie about where he had picked Clementina up. The woman accompanied Clementina. Simms went to a hotel for the night then left for Albany. Upon arriving at the Anderson home, the woman who had helped Clementina into the cab didn't want to go in, but Donohue told her she would have to. He took Clementina into his arms, as she was unable to speak or walk. She only moaned slightly as he took her from the coach. He rang the bell and made the woman who had accompanied him enter the house ahead of him. He lay the sick lady down on a sofa with a pillow under her head. At first he lied to Mr. Anderson, as Simms had told him to do. But Clemetina's death changed everything. No longer would glib lies to James Anderson suffice. A coroner's inquest, a hearing, and a trial followed, bringing out more evidence about how Clementina had met her tragic end. Browne already had a reputation for having shady goings-on at his house indicative that it was an abortion den. When his house was searched, the finds included the abortion instruments, blood, clothes, jewelry, and bloody rags. The coroner's jury ruled, "We find that Clementina Anderson came to her death by inflammation, produced by an abortion at the hands of Dr. Edward M. Browne; further, the Jury say that Augustus L. Simms was accessory before and after the fact." The case was delayed going to trial, mainly due to political and prosecutorial wrangling. When it finally went to trial in 1863, testimony certainly indicated that Clementina had died from a botched abortion. Simms testified that he knew of the pregnancy and had arranged for the abortion, to be performed by Browne. The physician who had performed the postmortem examination described the signs of recent pregnancy -- enlarged breasts, darkened areolae, an enlarged uterus, signs of where the placenta had detached from the uterine wall. Though the defense found doctors to try to explain everything away, Browne was convicted of third-degree manslaughter in Clementina's death. On November, 13, I blogged about the lack of information verifying the purported illegal abortion death of Pauline Roberson Shirley. Pauline's is one of a cluster of stories abortion-rights activists use to exemplify illegal abortion deaths. I'd always known there was a significant problem with their claim about Becky Bell -- there is absolutely zero evidence that Becky underwent an abortion. Every piece of evidence in her death indicates that she had a miscarriage while dying of the same strain of pneumonia that killed Muppets creator Jim Henson. They indicate that Pauline and her six children lived with her mother in Arizona while her husband was in California looking for work. They indicate that Pauline had an illegal abortion (without providing any information about a method or a perpetrator), was hospitalized, and bled to death. They add that Pauline's mother was searching for a blood donor. Well, today I finally tracked down Pauline Shirley's death certificate. The death certificate straightforwardly indicated that yes, Pauline Shirley, born June 2, 1910, died in an Arizona hospital. The date disagrees slightly, with the death certificate saying August 23, 1940, rather than the August 22 that is on the prochoice sites. The cause of death section indicates "secondary anemia" and "uterine hemorrhage," which I would say substantiates that Pauline had bled to death. THE DEATH CERTIFICATE DOES NOT CONFIRM AN INDUCED ABORTION. The cause of death is noted as "incomplete abortion, spontaneous (?)" "Abortion" is the medical term for a miscarriage. So what the medical examiner was indicating when he completed the death certificate was that it looked as if Pauline had died from a miscarriage, but he wasn't 100% sure. There is a section of the death certificate for information about external causes of death. This section is completely blank, even after an autopsy. That means that there were no signs that anybody had used instruments of any kind -- either of the medical or "coat hanger" type -- to perform an abortion on Pauline. This doesn't rule out abortifacients, of course. Pauline might have drunk an herbal tea or used some other concoction. 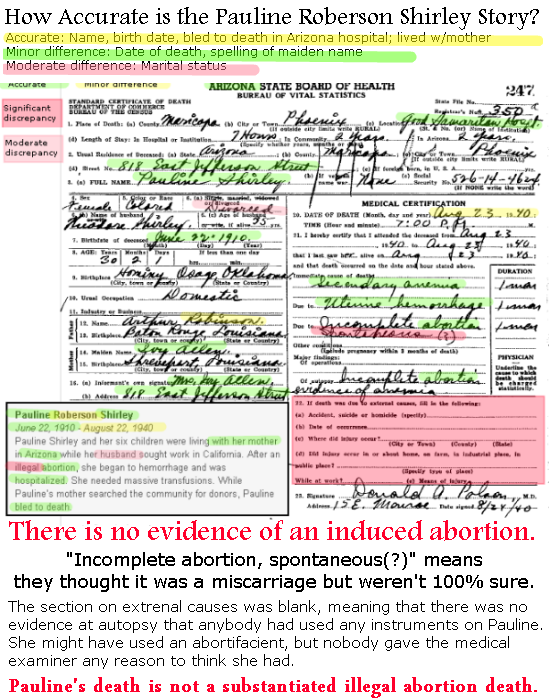 But in order to substantiate the assertion that Pauline died from an illegal abortion, rather than just died from complications of a miscarriage, there would have to be some documentation other than endless repetition of the same words on scads of abortion-rights web sites. I can never say with 100% certainty that Pauline didn't use some sort of abortifacient. But by far the preponderance of evidence that I've been able to uncover is that Pauline's death was not a criminal abortion death. Frankly, I can't understand why they keep using Becky Bell, for whom there is absolutely zero evidence of an illegal abortion, and Pauline Shirley, for whom there is merely the inability to prove that it was not an illegal abortion. There are plenty of verifiable illegal abortion deaths with abundant documentation supporting them. I've done all the legwork already! But nothing seems able to break into or out of the prochoice echo chamber, not even evidence like autopsy reports and death certificates. Dr. Joseph Nisonoff, his nurse, Camille Ewald, his receptionist, Pearl Tense, and Dr. Max J. Weinstein, who was thought to have referred Madeline to Nisonoff, were arrested. At the time of Madlyon's death, Nisonoff was out on bail after being charged with performing another abortion, which the woman survived. During six hours of questioning, he denied any knowledge of Madlyon's death. Elters told Assistant District Attorney James Carney that he and Madlyon they had gone to Nisonoff's office in Queens on November 13. They gave Nurse Ewald $600. She told Elters to "take a walk." He returned to find Madlyon resting on a couch. Joyce Chorney, age 25, died on November 18, 1953. Fifty-four-year-old Dr. Alfred Joseph was charged with criminal abortion in her death. Dr. Lillian Hobbs was convicted of murder in the 1917 abortion death of 29-year-old Ellen Matson. The fourth death in my records for November 18 is that of 24-year-old Anna Pozajevich. I don't know what qualifications her abortionist, Julia Adamovitch, had. Throughout the 20th century, while abortion was still illegal, there was a massive drop in maternal mortality overall, including for induced abortions. Abortion mortality data, as separate from total maternal mortality data, is available beginning in 1940, when the death toll was 1,407 in 1940. Though this is 1,407 too many, it is only between 24% and 28% of the 5,000 - 10,000 criminal abortion deaths typically claimed by abortion-rights organizations. Abortion deaths dropped to 744 in 1945, then to 263 in 1950. This is between 2.6% and 5% of the abortion-rights claims. Most researches attribute this plunge to the development of blood transfusion techniques and the introduction of antibiotics. And when you look at the trends, legalization didn't even make a blip on the line -- which makes sense, since 90% or more of pre-legalization abortions were being done by doctors, who would hardly close down their practices when the fear of prison was taken away. Learn more here. Ellen Matson was 29 years old, the daughter of Swedish immigrants. In the autumn of 1917, she told her boyfriend, Charles Morehouse, that she was pregnant, and had been taking quinine unsuccessfully to try to abort. Morehouse accompanied Ellen to a doctor, from whom he bought a box of “brown pills.” Ellen took these every hour for over two weeks, but like the quinine, they failed to cause an abortion. Morehouse found another doctor and started borrowing money from relatives. Ada confided in her mother, her sister, and her aunt. Though the two older women thought the abortion was a bad idea and tried to dissuade her, Ellen's aunt lent her $5. On November 1, 1917, Morehouse took Ellen to the office of Dr. Lillian Hobbs, (pictured) who was free pending trial for the 1916 abortion death of 21-year-old Alda Christopherson. Hobbs had also been implicated early in 1917 for the abortion death of Ruth Lemaire.Morrehouse evidently stayed with Ellen throughout the actual procedure, since he later testified that the doctor had used “a spray” on Ellen's “privated [sic] parts.” He left her with the doctor for aftercare, returning later to take Ellen home. She took ill after going home home, so she was taken to Hobbs' home, where her mother and sister visited her as her condition deteriorated. Ellen was finally taken to West End Hospital in Chicago, where she died on November 18. Hobbs was tried, convicted and sentenced to 14 years at Joliet for Ellen's death. 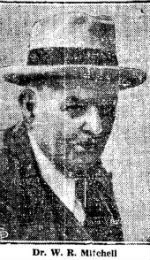 Marie's father identified Dr. W. R. Mitchell (pictured) as the perpetrator. 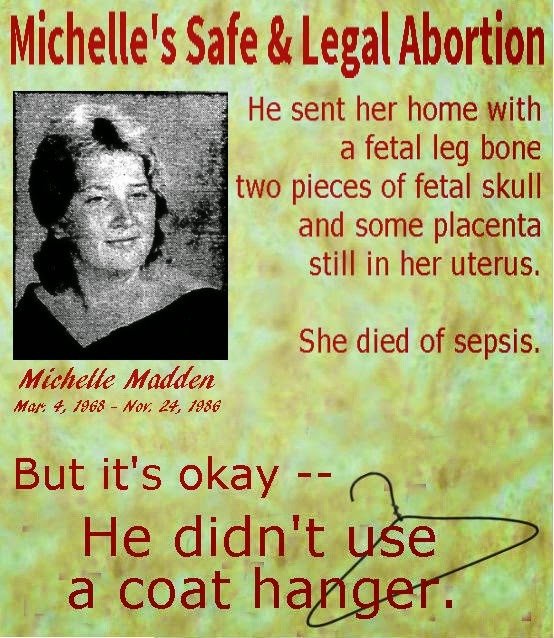 Mitchell was already a reputed abortionist, and police had already gotten many complaints about him prior to Marie's death. He was implicated in about half a dozen other abortion deaths, but I have been unable to get more details about those cases. A woman identified as "Patient A" (I'll call her "Adelle"), was 26 years old and had a history of anemia and sickle cell disease when she went to "Landmark Women's Center", which was the private practice of Dr. Mi Yong Kim but gave the appearance of being a clinic. At the end of the abortion, Kim noted that Adelle's pulse oximeter reading was only 70%, an alarming finding. Kim thought she found a pulse, did not assess whether or not Adelle was breathing, and simply ordered her staff to give her oxygen by mask and call 911. On November 16, 1905, 18-year-old Dorothy Spuhr died in County Hospital in Chicago from an abortion performed on November 13. Midwife Julia Gibson, aka Timmons, was arrested and held by the coroner's jury. Gibson went on to perpetrate a fatal abortion on Bessie Braun the following year. On November 15, 1901, 22-year-old Irma Brown (pictured) of Garden City, Kansas, died at County Hospital from complications of an abortion. Dr. Robert E. Gray, age 42, was arrested November 19 and held without bail. The original accusation had come from nurse Margaret Tedford, who had cared for Irma after she'd taken ill. During the trial, Gray's attorney raised doubt about whether Gray's conduct had been criminal or if he'd undertaken a procedure to save Irma's life after she'd been injured in a fall. Gray was acquitted. On November 15, 1912, 38-year-old Ida Kloie died in her Chicago home from an abortion perpetrated by midwife Minnie Neermann. That same day, 33-year-old homemaker Fannie Scheiner died at County Hospital in Chicago after an abortion perpetrated that day by midwife Annie Balnoka. Neerman was held by the Coroner on November 25, for Ida's death and was indicted by a Grand Jury on December 1, but the case never went to trial. 1875: Who Killed Mary Alice Foorman?